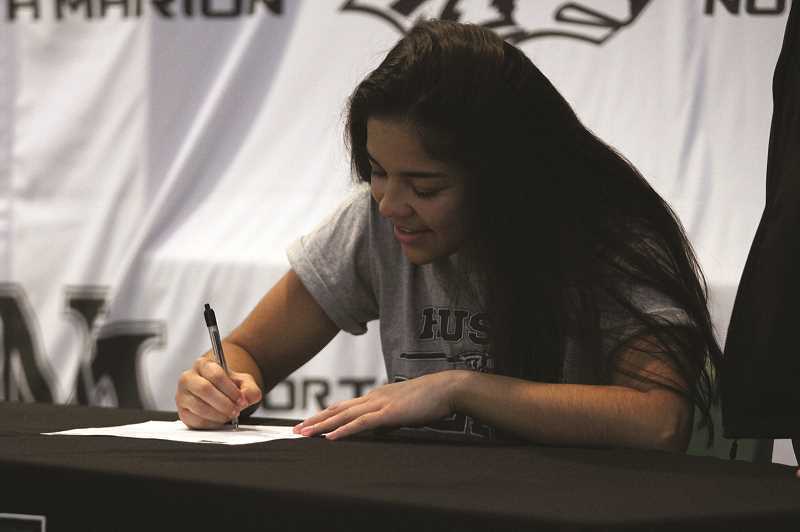 Considering Mar Verastegui's stature as one of the best 4A soccer players in the state, it's hard to imagine that she had only taken up the sport as a middle school student in 2014. Yet five years later, two months after wrapping up her high school career, the North Marion senior inked her name play collegiately at nearby Corban University in Salem. "It's a tribute to her and the amount of work she's put in," North Marion girls soccer head coach Ben Bonser said. "I don't think I've known any other player who worked harder." That her collegiate signing came during the middle of basketball season, mere hours before her team tipped off against the visiting Madras White Buffaloes on Friday, is a fitting juxtaposition to her athletic career at North Marion High School. As the leading scorer and captain of the girls' basketball team, Verastegui has long considered the winter sport her favorite. But given the opportunity that playing soccer has given her coupled with her competitive zeal, it was hard to pass up the chance to play and grow at the next level. "Basketball definitely has always been my favorite sport, and it's where my passion is most at," Verastegui said. "But I feel I have more chances at soccer and more room to improve as well." Part of that is due to her late start in picking up soccer. A gifted athlete, Verastegui tried out for her eighth grade team after constantly being asked if she played. After playing defense at middle school, she decided to give it one more year at the high school level to see if she'd enjoy it. Bonser saw that her prodigious athletic abilities were wasted on the defensive side of the ball, and with a little instruction, she could be a devastating scorer from the front line. "Her speed was astronomical," Bonser said. "She could get around everybody, but she just couldn't put it in the back of the net. We just worked on her with that. That year, she scored more goals than anybody else her freshman year, and from there she just continued to grow." Despite the newfound success on the field, it was the camaraderie of playing with her new teammates that kept her coming back to the program year after year. Verastegui credits the team's seniors — captains Laura Grigorieff and Rachel Breneman, along with Sarah Estrada, Sami Pine and Abi Campos — with making her feel immediately welcome. "They were very good with making connections with the younger players," Verastegui said. "I just felt included right away." As her comfort with the sport grew, so did her stature on the team and the Huskies' overall success, culminating in Verastegui's junior season when she led North Marion to an undefeated record in league play and the top seed in the 4A state tournament. Along the way she was named Oregon West Conference Player of the Year and helped guide the Huskies to the state quarterfinals, where the team suffered just its second loss of the season. Verastegui returned for her senior season this past fall, and though the Huskies couldn't duplicate the success of the previous season, Verastegui once again had an incredible season, finishing the year with 22 goals for an offense that was top five in the state. For her efforts, Verastegui garnered back-to-back First Team All-State nominations and attracted the attention of Corban head coach Aaron Lewis, who took over the women's program after guiding the men's team to six consecutive appearances in the NAIA National Championships from 2013-18. "I feel we share the same interest toward helping to build the program and making it into something else," Verastegui said. "I liked the campus and just the way he sees soccer and the way he coaches." For Verastegui, basketball will always be her primary passion. But with soccer, her future is wide open. "Aaron can help me get there," she said. "He has a lot of experience coaching, and I think he could help me become a better athlete."